Today, I come to you with a message that will clarify many doubts that take over your thoughts. Why are you suffering and feeling physical consequences while being purified? Why do you, when accomplishing the goal you so longed for, come to yourself to suffer, still? Well, My Children! At every event of your lives, where you are purging traumas, lower thought-forms that keep you imprisoned in illusion and suffering, pain and illness, bring with you the memories of suffering. The process of auric healing and cleansing, and the transformation provided by the Violet Flame, often causes uncomfortable physical sensations only for a reason, Children: you do not readily accept the blessing you receive. They are accustomed to living in suffering, in memories of pain and sorrow, and therefore they do not allow healing to happen, that cleansing occurs lightly and smoothly. When they go through situations where they have the opportunity to heal karmic issues, which have been dragging for many ages, they do not readily accept healing. They are so engrossed in that feeling that has been with them for ages that they no longer know what it's like to be different from that. They do not remember happiness, joy! They can not imagine how happy they would be if that suffering and remembrance of pain no longer existed. Therefore, My Beloved Sons, let the painful memories of suffering be carried away by the Violet Flame. But for this it is necessary to accept the feeling. To accept living, for a brief moment, that memory, that experience - the closing of the cycle. And at that moment the Violet Flame can cleanse and finally heal your karma. Take action naturally in front of your new reality of happiness. Look at you and this moment with calm and acceptance. This moment only shows what the Truth is and how everything was always, but you would not allow yourself to look with your heart. The truth was before you all the time. Happiness, healing, problem solving was already real in your present moment, but you would not allow yourself to see. Therefore, My Sons, nothing has changed and, yes, it remains as it always has. The only change that had happened was his way of looking at the reality of happiness that was there before you. All experiences of suffering were present only in his mind. You have created this way of looking at the world and your life. But it was not real. The only transformation that takes place from now on is in you, because the veil of illusion is removed so that it allows you to see the reality. There is no way to remain in ancient thought. The sudden change in the way of looking may be a shock, but it is only a change of look. If they insist on maintaining the form of thought and the old look before their life, they will feel physical consequences for not accepting the cure. The process will be more painful. Accept the cure. Accept the intervention of the Violet Flame in the painful karmic situation and allow it to act by healing, cleansing and transmuting the suffering in Love, in elevation. Therefore, My Sons, I come to clarify how you should act in these situations, which will be more and more constant in your lives. When the opportunity arises to face something that, at first, had already healed, look within. Accept the tears. Accept look at the situation for one last time, without fear, and without hiding what you really feel in your heart. Allow to feel and then heal with the transmuting power of the Violet Flame and only then will the healing be final. Go forward, without fear, My Beloved Sons! Fear will be left behind in a memory that can not be remembered. Have courage and strength to face your fears and the causes of your sufferings. So be all healed and radiated in the Violet Flame. 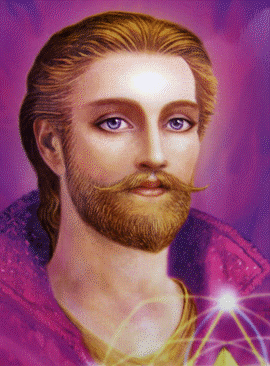 Who is Master Saint Germain?